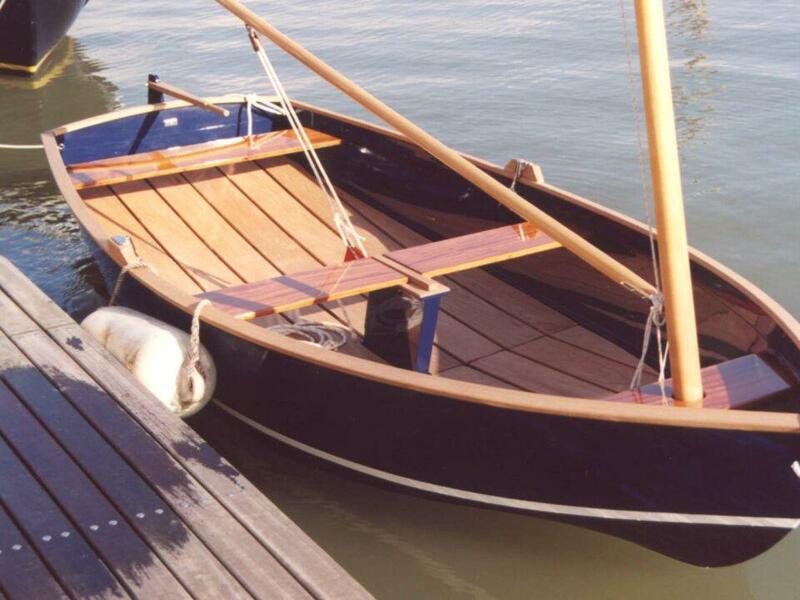 The All Purpose Skiff "LENNART"
Our "All Purpose Skiff LENNART" impresses by its classical lines, the high level of workmanship and the various possibilities to use it. The low weight and the favorable flow resistance as well as the low friction of its coat allow a brisk propulsion without a great effort. 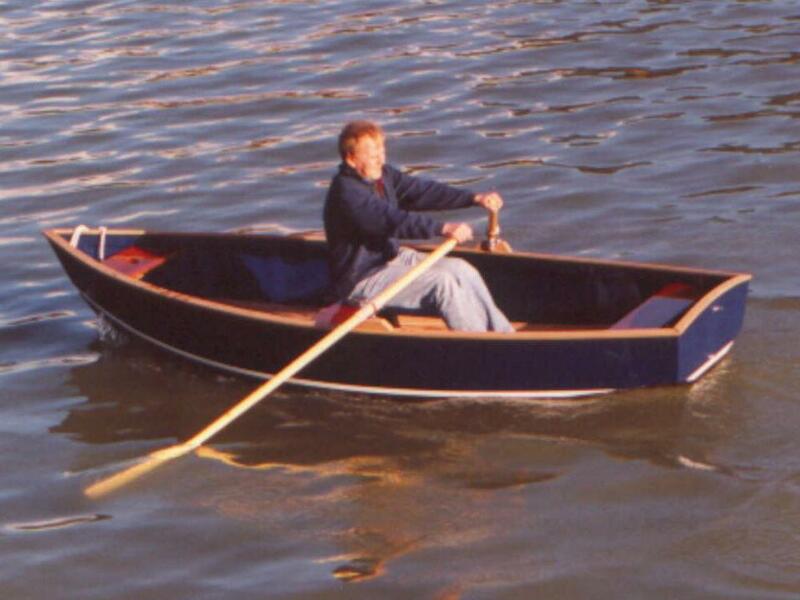 The long skeg keeps the boat in its direction, which makes it easy to handle. 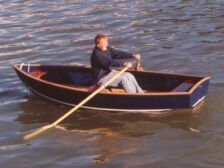 If requested, the "All Purpose Skiff LENNART" is available with a centerboard and a rudderblade attached to the stern including tiller. Also available: mast, sail and fittings. The mast is to be passed through the front seat and to be locked. With a flick of the wrist the rowing boat changes to be a sailboat. 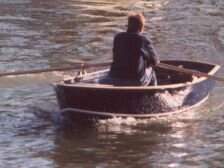 A small outboard engine (3 HP), attached to the stern allows the boat to get up speed. Also available is an electric engine, optimal to use in protected areas where any pollutions are prohibited. Due to measures and weight the boat can be cartopped with no great effort. Lenghth: 3,60 m/ 12 ft.
Width : 1,45 m/ 4.8 ft. The bottom boards are composed of four segments, that can be removed easily. The weight of the boat is reducable to 20 kg/ 44 lbs. less by only removing the bottom boards. Then the skiff can be carried easily by two persons. Further weight reduction can be achieved ordering our ultralight version with a 30 kg/ 66 lbs. net weight. The components made of teak are absolute wheatherproof with no necessarity of suface treatment. In the process of time it developes a silvery shine, which produces an impressing effect by the interaction with laquered surfaces. Due to its technical characteristics wood is still the favorable material in boatbuilding. Wood has a tough strenght compared with its low weight, and it does not lose it even after being used for a very long time. Wood, as a regenerating raw material, gets more and more important considering ecological standards. The big disadvantage with boats, traditinonally built of solid wood, however are its large expenses in manufacturing and maintenance. We have solved this problem by bending and glueing plywood over specially designed appliances and coating the hull with high quality epoxy resins to achieve a resistant and tough surface. 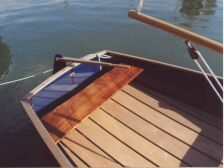 By using components composed of varnished mahogany such as seats or bottom boards and edge moulding made of uncoated teakwood, the skiff gets the typical character of a traditional wooden boat. LENNART "B" with straight stem (simplier and inexpensive building method). Version "B" is, if requested, available in various measures. The hull is available in the colors of yachtpaintmanufacturers like INTERLUX or clear varnished. 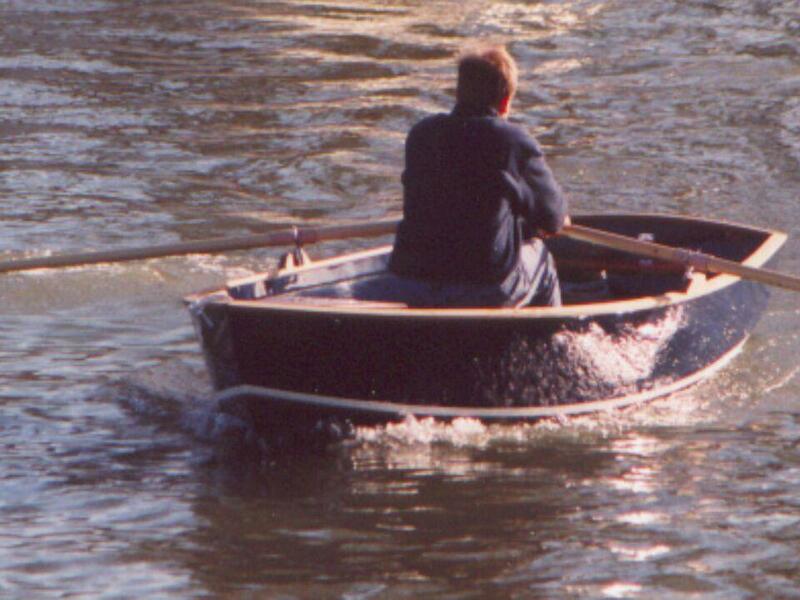 Interested in self-boatbuilding? You can order single components, coated or uncoated,to finish and assemble it without needing extraordinary tools. The components like seats, bottom boards etc. can be delivered in various woods and coatings.